Images of Los Angeles in art, film, television, and advertising have captivated global audiences for decades. This weekend, a group of filmmakers, critics, historians, and writers visited Zócalo at the Getty Center to participate in three panels exploring how L.A. has shaped the world. 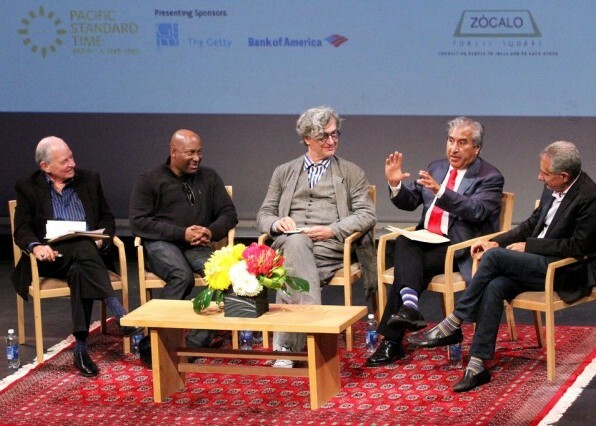 The half-day Zócalo/Getty conference, entitled “How Los Angeles Invented the World,” was part of Pacific Standard Time, an initiative of the Getty with arts institutions across Southern California. Directors William Friedkin (To Live and Die in L.A. and The Exorcist), Wim Wenders (Paris, Texas and The Million Dollar Hotel), and John Singleton (Boyz n the Hood), essayist Richard Rodriguez, critics Kenneth Turan and Richard Schickel, and some the country’s most prominent curators, historians, and journalists filled the Harold M. Williams Auditorium to capacity, with an overflow crowd watching in a nearby simulcast room. Has the Dream Become Deranged? To the rest of the world, Los Angeles is palm trees and stucco homes, crowded freeways, Mickey Mouse, and the violence of the 1992 riots. 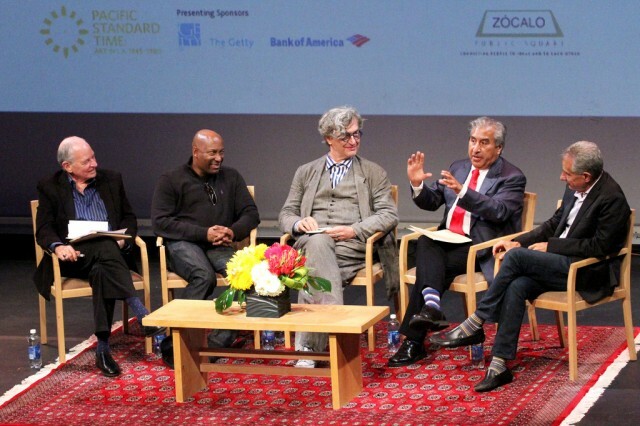 In a conversation about the past and future of L.A.’s global image, frequently interspersed with audience applause and laughter, four interpreters of the city–directors Wim Wenders and John Singleton, essayist Richard Rodriguez, and architect Eric Owen Moss–talked about the tension between the realities and fictions of Los Angeles. “It’s manufactured, but it’s also real,” Singleton replied. Los Angeles is beautiful, he said, but it has an interesting underbelly and a complex identity thanks to people from all over the world who come here “to reinvent themselves,” he said–whether from Europe or Schenectady or Weehawken. “Los Angeles is a place where you can come as a caterpillar and become a butterfly,” he said. Wenders–who identified himself as the only foreigner on the panel–arrived in L.A. in 1972 and found a city that seemed to exist on a different planet. “The first thing I did was drive through Mullholland Drive, and I thought I was in a spaceship,” he said. Still more surreal, though, was returning to Germany. L.A. became a dream place that “lost all reality when I left.” Wenders felt he couldn’t even talk about his life here because no one would believe it. “The movies that I make [in L.A.] are about that conflict between the fiction and the reality,” he said. “Los Angeles is about stories and fiction and dreams”–and these fantasies have an incredible effect not just on the world but on themselves, forming a sort of closed feedback loop that can become dangerously insular. For Moss, the freeway is more than a symbol or dream of L.A. “Physiologically the city is largely defined by … infrastructure,” he said. The city was built around the east-west split of the 405, giving an odd power to the civil engineer who, long ago, decided to build the freeway through the path of least resistance. Pointing again to the empty freeway behind him, Rodriguez said that people come to L.A. to be there–on that empty stretch of road–only to have that dream, and others, deferred. Singleton agreed, saying that it’s a place where people go with dreams only to have them dashed. “The problem with dreams is they die many times, and they turn into something as mundane as our lives,” said Rodriguez. Singleton agreed, explaining that trying to make reality-based films without gratuitous violence was impossible in Hollywood. He didn’t work for years until he capitulated (making Shaft with Samuel Jackson)–and he felt he lost something as a filmmaker by giving in. The very things that frustrate critics of Los Angeles–its sprawl, its hidden spaces, its secret powers, its impermanence–have made the city a uniquely compelling film character, said a panel of filmmakers and critics focused on movie portraits of the city and how they have shaped how Angelenos see themselves. Before World War II, films showed L.A. as a happy place. Since then, the film noir view has prevailed onscreen–and in popular conceptions of the city as a dark or superficial place. “One of my thoughts about Los Angeles in general is that it’s a hidden city,” said Los Angeles Times film critic Kenneth Turan, praising the 1967 Lee Marvin film Point Blank as a portrait of the hidden L.A.
One thing that obscures L.A. is the pace of change, the panelists said. “Face it: Los Angeles is an incredibly unstable place,” said film historian Richard Schickel. And the instability–“the impermanence”–of the city is dramatic. Director William Friedkin said it was this quality that shaped his 1985 thriller To Live and Die in L.A. To portray the city, he sought out more obscure places, such as the Vincent Thomas Bridge, that he had never before seen on film. “I wanted slick, sun-bleached freeways, reflective surfaces, and nothing that had any kind of a permanent feeling to it whatsoever,” he said. The darker portraits of Los Angeles often came from New Yorkers and other transplanted writers who moved to L.A. to work in Hollywood–and didn’t like it. And generations of directors have exploited the negative view of Los Angeles less subtly: by demolishing it in all sorts of apocalyptic movies. Friedkin said the 1982 film Blade Runner “is the best film I’ve seen about Los Angeles.” He called it “prophetic” in predicting the presence of large TV screens throughout society; environmental degradation; and the breakdown of social connection evidenced in the California budget crisis. That said, Friedkin and other panelists said that the best, most realistic portrayals of Los Angeles as it is are found in the past. Said Andersen: “I think the golden era of filmmaking in Los Angeles was probably the 1910s and the ’20s, when it was possible–before the coming of sound–for filmmakers to film on the streets.” When sound came to movies, filming moved inside to the studios. The question and answer period was dominated by sharp, funny exchanges, usually involving Friedkin. Schickel said Angelenos treasure their connection to film, and mentioned a scene in Walker Percy’s 1961 novel The Moviegoer in which a character encounters the actor William Holden on the street. When she was researching postwar pop culture history, Kirse Granat May, author of Golden State, Golden Youth, found that one place seemed to be steadily muscling out the others. “California kept popping up,” May explained during a discussion on how Los Angeles created the good life. Photographs and advertisements of healthy California youth, of California outdoor living, of California safety–all of these were being celebrated and echoed in American pop culture in the mid-20th century. “These images were powerful nationally and internationally,” May said, noting that Californians themselves bought into the dream even as they were selling it to others. For Avila, “the success of Disney fundamentally corresponded to the desire of millions of consumers who recognized that Midwestern, small-town white worldview.” This was reflected in the entire approach to real estate development during those years, when entire cities sprang up out of the desert and imported Midwestern habits and mores and people. Fear, however, was also central to the California experience. The privacy and security of one’s community also promised a refuge from the things that were frightening–like juvenile delinquency, racial differences, or war. Even as House Beautiful was enticing Americans with pictures of dream houses in the Pacific Palisades, Watts noted, the Los Angeles Times would carry a chart showing the “rings of radiation” that would emanate from a strike on the city’s downtown. Amid the racial fears, however, was a lot of cross-cultural borrowing. The Pendleton shirts in fashion among Chicanos became the “board shirts” of surfers. People were using their incomes to purchase “commodities that were used to create these things that did not fit with dominant identity,” Avila said. As for the white-suburban postwar imagery for which California became known, it’s in many ways little more than a relic, as the state has undergone immense cultural and demographic shifts. Nevertheless, noted May, the vision still exerts a lot of power over people’s imaginations. “Images are like vampires,” she said. They stick around. Read opinions about what film best captures L.A. here.